Soon to be in stock, the BRAND NEW Johnson Matthey (JM) 1oz Silver bars. These will be priced at $2.25 over spot silver. Discounts available for 500oz or more. The Gold "Red Carpet Theory"
Many of you have expressed your concern to me about the liquidation of your gold position, and I have said, "gold is the most liquid asset in the world because it has the longest track record to perform as money, longer than ANY other currency that has ever existed." 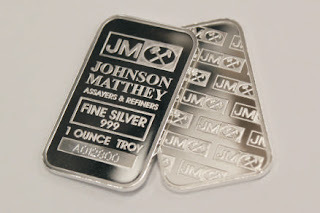 Aside from selling it on the street in a "worst case scenario," you can take your coins or bars to any reputable bullion dealer (Central Metals Corp.) or bank. Never forget that you own REAL money and it's recognized all around the world as MONEY! I have suggested to many of you that there may come a time when you will not need to sell your gold because when you walk into a bank, they will roll out the "Red Carpet" for you because you have REAL tangible wealth and the bankers will be very anxious to give you a collateral loan on your gold. The article I posted below supports my "Red Carpet Theory." Imagine the housing craze times a hundred. Think of how easy bankers were giving mortgages on homes. Now think of all the effort and paperwork involved in selling a property, compared to how fast you can sell gold? It's a no-brainer for bankers to lend you money on your gold. Ross Norman looks at the implications for gold of an increased focus on the assets banks are allowed to hold as tier one capital. A video from Chris Duane. A great interview by Eric King (www.kingworldnews.com) with Egon von Greyerz, regarding gold storage at a bank. This is part of the reason why we offer the "U-Vault Account." Gold demand in China may surge as much as 30 percent this year as rising incomes boost consumption, helping the country topple India as the world’s largest bullion market on an annual basis, according to the World Gold Council. Sent to us from a valued client. A 12 year old girl wakes up the banking community. MUST SEE, only 6 mins. CIVILIZED!?! Central banks around the world are buying gold. Gold has outperformed every asset class in the past 12 years, even Berkshire Shares. 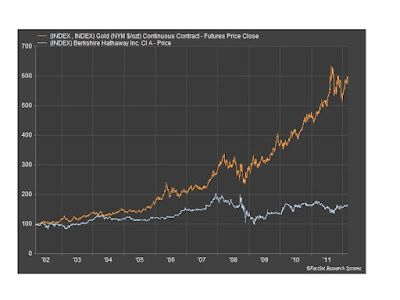 Gold and Silver, What Has Really Changed? Ask yourself if you think the condition of the global economy is better or worse than last year when gold was $1,900 and silver was $48? Are countries more in debt? Are there more tensions between nations? Are there more demonstrations? Is the financial condition in Europe better or worse? Is the USDX higher or lower? Please recognize a good buying opportunity when it's presented to you. One year from now many will be saying, "I wish I bought gold last May." A Rebellion at the Federal Reserve? Chicago Federal Reserve president Charles Evans doesn't look the part of a heretic. But in the cozy, conservative club that is central banking, he certainly qualifies. While most of his colleagues at the Fed have recently taken an even more hawkish turn, Evans remains a champion of additional monetary stimulus. And on Tuesday he took an even bigger step: He became the first sitting Fed member to endorse nominal GDP (NGDP) level targeting.